Two weeks ago, I wrote about a mysterious billboard and why, after some thought, I realized that sometimes “What? ?” is exactly the response you want. After I wrote that post, I considered calling the people who had bought the billboard ad and asking them — did it work? Did you get the website traffic, physical visitors, and increased sales you wanted from the mysterious billboard? What were your results? Then I realized that they have no way of knowing those answers. There’s no way to track who saw the billboard and typed in the URL they read. No way to distinguish them from site visitors who found them through Google, or picked up a business card or brochure, or talked to someone on the phone. 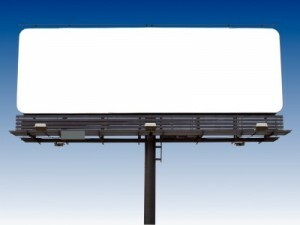 A billboard that size on a major north-south interstate costs roughly $2000 per month. That’s a huge investment in advertising to make without some means of knowing that it’s working. That’s what I meant by “someone was half clever;” they realized that the mystery would create curiosity and increase their website visitors (and hopefully also physical visitors who would engage with them), but they failed to set up a way to track results. I would have set up a separate landing page, something like TheirDomainName.com/who, with traffic from the billboard going directly to that page. That would give me good statistics. How many people typed in that URL will show up in analytics reporting as “traffic source: direct.” Those people, and only those people, saw the billboard and were moved to follow up on their curiosity by opening the URL in a browser..
On that landing page, I might have put a special offer that you could only get if you called and said “I saw it on the billboard.” It might even be possible to set up a separate phone number on that landing page, so that calls to that number must have come from the billboard. This would give the company a clear way to track the effectiveness of their advertising dollars. Use your web-based tools to full advantage. Set up separate landing pages linking to dedicated email addresses or phone numbers. Track your statistics and measure the results — that’s the only way to find out what’s working and what isn’t. Or… pay $25,000 a year to a billboard company and hope for the best. Need some help setting up web-based tools to help track your advertising efforts? Give me a call at 205-924-5146 or shoot an email. I’m here and ready to help you get results.